The foil pouch indicates it’s hot off the grill and helps contain the messy, flavourful King Eddy sandwich, a glorious symphony of sweet, salty, and spicy. It starts with a fried egg — its edges curled and crispy, the yoke perfectly cooked. And then comes the sausage patty. When Tim Horton’s was experimenting with their first breakfast sandwich, they tried a patty with kick. But they dumbed it down and I never went back. Not here. Scratchy’s maple-and-herb sausage patty delivers some peppery oomph. Melted cheddar and garlicky mayo glue it all together. $7. Taking a cue from its home in Chinatown, Bar Robo serves up a Szechuan-inspired breakfast treat. 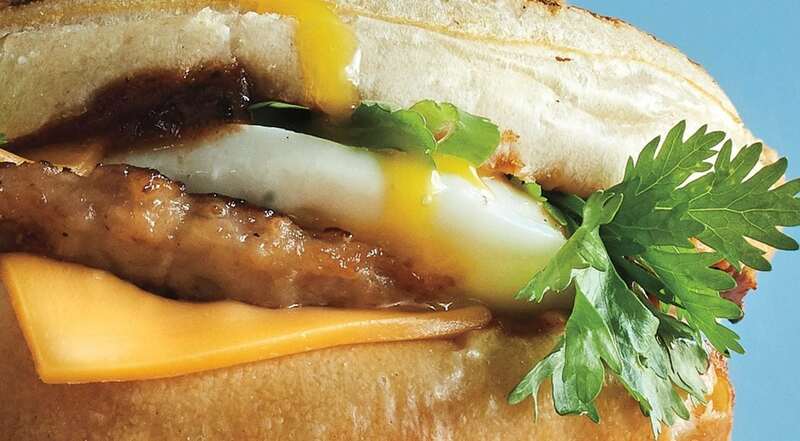 The usual suspects — fried egg, slice of cheddar, patty of sausage — are combined with the unexpected: green onions, cilantro, and a tangy Szechuan barbecue sauce. The pow of salty, sweet, and heat is a great wake-up call. And unlike the usual bready sandwiches, this one comes in a panini, which means, technically, it’s straight from the grill: crunchy on the outside, warm and soft inside, the cheese perfectly gooey. $6. Why use bread when you can use sweet potato instead? Swap your classic English muffin for two pieces of toasted sweet potato. Good Eats loads the crispy skins with a generous portion of veggie (or pork) bacon, the salty bursts of flavour tempered by a fresh combo of mixed greens, tomato, and house basil mayo. Despite the lack of carbs, it’s surprisingly filling. If sweet potato isn’t your thing, you can also opt for the sandwich on Good Eats bread. $6.50. This Common Eatery sandwich is anything but common. It starts with sourdough bread and a green tomato. A fried egg rests on top slices of double-smoked bacon and applewood smoked cheddar. Fear not, vegetarians, you can easily substitute the meat for a grilled portobello mushroom. The creation is topped with a drizzle of malt aioli. $9. The Wild Oat delivers a unique and satisfying morning wake-up ’wich. Served on a warm, freshly baked croissant, inside you’ll find a fried free-range egg — runny in the middle and crispy on the outside. It comes with tomato, mixed greens, mayo, and sprouts. (The sprouts not only deliver extra crunch but leave the mouth feeling fresh.) 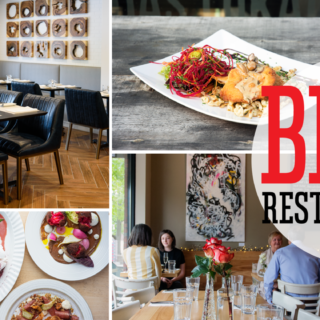 Wild Oat offers a variety of add-ons: the avocado and goat cheese make a good combo. If you’re not in the mood for a buttery croissant, you can opt for the sandwich on toast or a kamut bun. $6.